There are no two thoughts on the fact that Ashwin Sanghi has made his own unique place in the literary world. He has his own fan following and readers love to read his fast paced thrillers. It is obvious for any thriller lover to draw parallel between Ashwin Sanghi’s work and the same of Dan Brown. In fact, many of the readers refer him as Dan Brown of India. Interestingly, when Dan Brown came to visit India, Ashwin has shared stage with him. 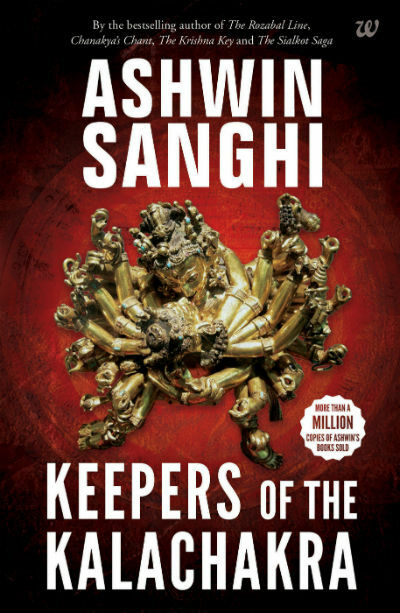 The latest book by Ashwin is titled Keepers of KalaChakra. Kalachakra is an interesting concept in the Hindu mythology which can literally be translated as “the wheel of time”. After Siddhartha became Gautam Buddha, many people around the world followed the way of living suggested by Buddha, and are known as Buddhists. The divisive politics from invaders made many people to believe the Sikhs, Jains, Buddhists are different than the Hindus and so on. Just put apart all these divisive politics and propaganda which came to existence with the sole aim to divide people and just put them in a situation that they enjoy fighting with each other. The people with divisive vision didn’t spare any religion and made people to fight against each other within and outside of their religious group. The center thought of this book (though, it is never explored exactly in words explicitly so) is to expose such stuff and make people believe in the humanitarian way of living. Let us take a look at the cover page of this book. As you can see, the cover page interesting. The balanced use of bright colors along with the black, and a representation of Kalachakra makes it quite interesting and eye catcher. The thriller lovers will be attracted to the book by its cover. Discussing about the plot of a thriller and providing reviews for various aspects of the same is nothing less than walking on tight rope, if you care to avoid spoilers. Let us try to look at it that way. There are two distinct souls who had almost similar tragic past. The life wasn’t started in good terms for them. Though rather than crying for what they didn’t get by birth, they focused on achieving by hard work supported by their distinguish talents. The boy became one of the best research analysts in the world of Physics, and the girl’s love for biology brought her to a remarkable position in her field. Though, they never uttered the magical 3 words (I Love You – as they say in typical romantic Bollywood movie), they are each others real friends. They cared for each other, and the time they moved away from each other (by whatever reasons) makes them believe that they cannot live without each other. Their fate took a turn. The boy got a job in a research company which is considered as the best in the world and he had to live in isolation for a remarkable period. The girl had to perform her research for some rare-to-find herbs in the area where due to the security reasons, the permission from the ministry is required. Unknown to them, their area of work will be very near to each other. And so does the circumstance. The Islamic terrorism is rising around the world and some hardliners made the life hell for the many. Europe is on unrest. But, the rest of the world cannot live the life of peace. Prominent figures from all powerful countries around world started being attacked mysteriously. There is no breach in the security, and yet, each death is a mystery in its own! In fact, each attack is a mystery in its own. It seems that not a single prominent political leader around the world is going to spared from this killing spree. Who is behind all these tragic incidents and why he/she is doing it? Or is it an organization? What all the top investigation and security agencies around the world like CIA, RAW and others doing during all these? Actually, there is a small team where members of each security agency work in conjunction with each other to prevent any havoc and fight the terrorism by co-operating with each other; but then, whey they seems failing in preventing such deliberate attacks? Isn’t there any way to prevent the world from getting doomed? Well, you need to read the book to get the answers for all your questions 🙂 . When you read the book, it starts with attacks, murders and tragic incidents. And, this review talks about the rags to reaches stuff and a love story; so you may think that I got it wrong. Actually, no. But, it is one of the best part of the book according to me. I like the way the characters of Vijay and Sujatha are written. Though, they didn’t born with a golden spoon in their mouths, they made their life journey remarkable. This is what one needs to learn. Life may be unfair to you, but everyone have their own set of complaints with the life. What makes one different than the others, how he/she deals with it. These strong character make the book a fantastic reading experience. The other thing I like in the book is the absence of adult material. Nowadays it is a fashion amongst writers to use cuss words and write at a length about adulteries in order to woo a specific set of readers. In fact, we’d found some such stuff in some of the books by Ashwin also, this book is however free of such stuff. There are plenty of characters in this book including Brhamananda, Sharma, Minerva, Mikhailov, Petrov, Judith, Williams, Mafraqui in addition to the protagonists and almost all of them are given proper attention they require. It was quite possible to lose track with at least some of them, but the author seems in control. The author bravely talks about various religions and terrorism and that too without being controversial, it is an art, indeed. The strong characters of the book makes it an interesting read. And yes, the author tries giving justice to all all the characters in the book and the gender of the character doesn’t have any influence on the same. Now, this is called, real gender equality. .. Rama needed to take that away from Ravana to secure the borders of his kingdom. That was the reason of his trip. Exile and retrieval of Sita was mere eye wash…. What we call reality is the combination of observer and observed. We seem to create our reality and that is precisely what Vedanta wants us to understand. The greatest mistake that humans make is to think that they are distinct and separate from the rest of the universe around them. Just because the probability of your taking a right turn along a given path is 80 per cent does not mean that you will take it. There is always free will. Free will that can influence the probability function is dharma. The observer influences the observed, the subject and object are indivisible and indistinguishable. There is no division. The book is full of philosophical writings, but at the same time there are some satirical lines as well. Also, there are points where the book tries to serve dark humor as well. It was supposedly a charity polo match, but there seemed to be nothing remotely charitable about it. … The farcical truth was that the most people who attended such events rarely needed to work. During his seventh standard exams, his mathematics paper included the question: “Indicate which of the following states are either true or false”. Vijay’s answer was single line that indicated his almost intuitive grasp of grammar as well: “All of the statement are either true or false”. He then proceeded to provide the usually expected answers overleaf. .. as she pushed the IV needle into Vijay’s vein without worrying about being gentle. This was no time for niceties. Sometimes, the only solutions that worked were redial ones. Learn to live with yourself. It can be terrifying. I have no evidence, but absence of evidence is not evidence of absence. The author found an interesting way to explain the emotions. He could tolerate the harsh cold of Kargil when he was in battle mode but seemingly went soft when he wasn’t. The author, at the end of the book, provides a large list of reference books he used for his research work. His assessment of various religions, especially his logical conversations about Islam and Islamism and its political impact are interestingly written. … I think that there are two things that distinguish them. One – adherents of these faiths no longer take their texts literally. Two – for the most part they have separated religion and state. … love was not about finding someone you could live with. Rather, it was about finding someone your couldn’t live without…. 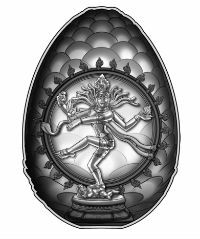 Also the way the statue of Nataraja was referred in a company symbol, will remind you the reference of using the same by CERN (which Dan Brown also referred in one of his books). Aurangzeb was a zealot, one who wantonly destroyed…. Overall a nicely written thriller which has more positives then the letdowns. Buy it when a book promotion is running, and you will get the value for your money. The way the author talks about religions and tries to weave science and mythology in mostly convincing way will be a treat for enthusiastic readers.